Are ya headed to HEAP in Tyler? Are ya going to the Junior League Gift Market in Waco? Will you shop The P in Royse City? Me? Wanna know what I'm doing? I am going to clean out my truck. 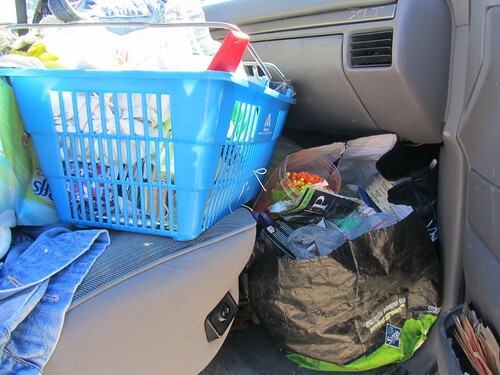 See that bag on the floorboard and that blue basket? They are full of supplies. You know. Price tags. Scissors. Tape. Hole puncher. Pens. Hammer. Can o' nails. Screws. Zip ties. Screwdrivers, Phillips and Flat head. Tools. Supplies. 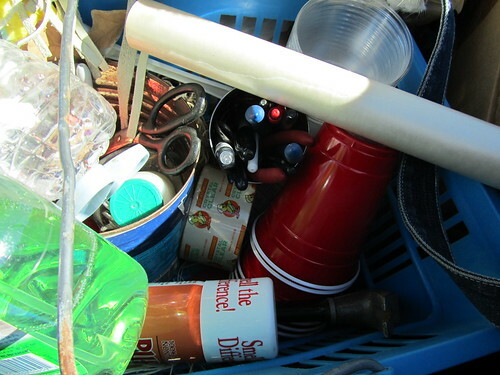 The stuff most dealers keep in a nice, orderly place, I guess. I'm not just going to clean out my truck. I am going to organize my bidness. 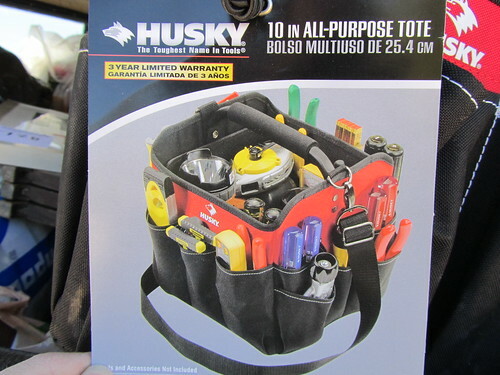 I bought myself a Husky All Purpose Tote. I am quite certain this is the answer to all of my disorganization. Do you get all giddy inside, and feel butterflies when you see it? 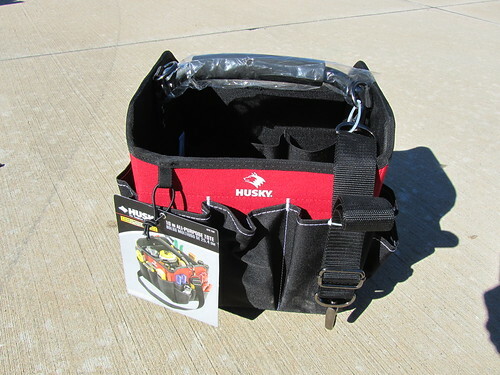 So, I bought myself this wonderful, heavy duty, kick booty piece of pockets and handles and straps. Oh my! I am ditching the bag and the blue basket this weekend. Now, David will have somewhere to sit when we go shopping! What about you? 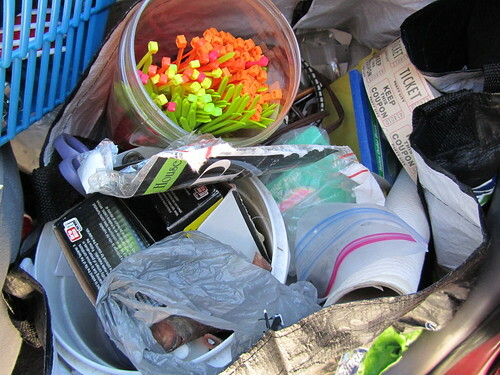 Do you keep all of your supplies in an organized fashion? I'm going to Horton's in Tipton tomorrow! It's my first time and I can't wait! Good luck with the organizer thingy! I think we should get Robelyn to make us some very fashionable organizational bags!! But they have to be rednecked up! Our cars all look alike. I was lovin' the bag until I saw the name. Surely a crafter like myself could figure a way of covering it. Have a great weekend. I'll be working at Leola's. I love your truck !! Unfortunately my truck (on a good day) looks like your before picture. My photo would include some soon to be recycled Diet Coke cans and junk mail that was sorted to the floor after stopping at the mailbox. As for me, I am resting for a few hours and try to catch up on my blogging today. Tackling the front porch clutter tomorrow! My husband has one of those bags and he likes it. He uses it for his most frequently used tools. It's handy for little jobs. I applaud you on your attempt to organize your stuff. I wish someone would come and help me organize my kitchen cabinets. gurl, that be ugly! not much makes me happier than a good organizing project! good luck! p.s. does this mean david won't be sitting in the middle any more?! Ha Mindy Girl... you go! no. i don't. but you can't go wrong with zip ties - shower curtain hooks and DUCT TAPE!! !